Botond Szlabony, our Hungarian IB student, shares his CAS experience in Greece and how it shaped him to want to do more for the environment. Since arriving at Institut Montana Zugerberg three years ago from Hungary, with very little English, Botond has consistently carved out a path to success. Applying the same discipline that he has in his athletic pursuits to his academics, he has not only become fluent in English, but recently had the senior boys’ football team, of which he is the captain of, win a football tournament which also saw two of its team members win an award for the top scorer and best goalkeeper of the tournament. Thus, he not only leads himself to success but also that of his peers and teammates. As an IB student, the CAS is an integral part of his programme. Standing for creativity, activity, service (CAS), the CAS is one of the three essential elements that every student must complete as part of the Diploma Programme (DP). 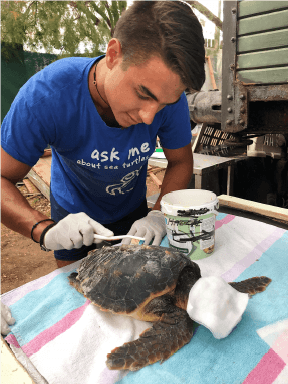 For the service component, he went on a trip to Greece last year which made him realize just how important it is to help others – be it man or animal. All in all, Botond would like for everyone to be more aware of their consumption and habits. If everyone thinks that they are just using one straw or one plastic bag, in a world of over 7.7 billion people, then nothing positive can come out of this in the long term. For a better world, remember: Reduce. Recycle. Reuse.